Originally printed on January 24, 2019 in the Ely Standard. 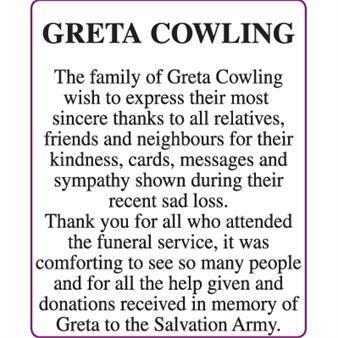 GRETA COWLING The family of Greta Cowling wish to express their most sincere thanks to all relatives, friends and neighbours for their kindness, cards, messages and sympathy shown during their recent sad loss. 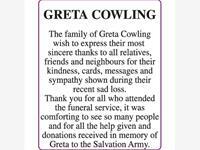 Thank you for all who attended the funeral service, it was comforting to see so many people and for all the help given and donations received in memory of Greta to the Salvation Army.